Gunner 222556 50th Div. Ammunition Col., Royal Field Artillery. Edward Oldham was born about 1897 in Ironville, son of Joseph Oldham, an ironworks/brickmaker’s labourer and Harriett Oldham (nee Burrell). In 1901 and 1911 the family was living at Dixie Street Jacksdale, at which time Edward was employed as an office boy and his elder sister Florence was a dressmaker’s assistant. However, ‘Soldiers Who Died in the Great War’ states that his place of residence was Bullwell, Nottingham.and the census indicates that Edward had a sister named Florence. Little is known about his service history or the circumstances of his death, as records merely state that he ‘died’ on Monday 14th October 1918, age 22 years. 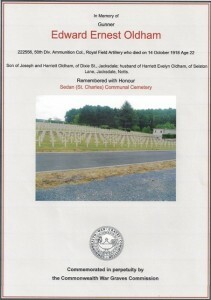 The Soldiers Died CD states that he also served with The Royal Horse Artillery. On the register of Soldiers’ Personal Effects it stated that Edward could have died any time between 22nd August and 22nd November 1918 and that he was taken prisoner of war in Germany. It should be noted, however, that Commonwealth War Graves Commision records show date of death as 14th October 1918. Effects amounting to £29 17s 6d were sent to his widow Harriett in June 1920 and this included a war gratuity of £9 10s. He is buried at the Sedan (St Charles) Communal Cemetery, Ardennes, France along with 49 other Commonwealth casualties of the Great War. Edward was awarded the British War and Victory Medals. Edward left a wife named Harriett Evelyn (nee Brailsford) who lived at Selston Lane, Jacksdale. A local resident has informed us that Ernest and Harriett did not have any children. After the war, Harriet ran a clothing shop on the corner of the Selston and Main Roads, next to the old Picture Palace. His sister Florence married a soldier named Victor Elliott in October 1918.